Nestled along a secondary highway between Boquete and David in the province of Chiriquí lies a little-known gem called Potrerillos, meaning “Little Pastures.” Curiously, the town is unusual in that it is divided into two pueblos, or small towns, Potrerillos Arriba and Potrerillos Abajo (upper and lower town). 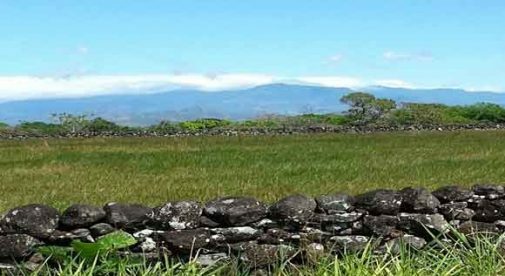 Aptly named “Little Pastures,” it was so called for the miles of low volcanic rock fences dividing the properties. These walls were constructed by the indigenous population several centuries ago to form cattle pastures. The towns are clean, the scenery is spectacular, and Panama’s highest mountain, Volcan Baru, looms majestically in the background. Flowers grow in abundance throughout this area. Vibrant, multi-hued blossoms grow everywhere in what seems like reckless abandon. Not only in private yards but, unbelievably, you can see a riotous profusion of startling, almost fluorescent pink, red, fuschia, and purple bougainvillea trees over 20 feet tall and loaded with blossoms along both sides of the highway. Similar to everywhere in Panama, you’ll find friendly, happy people and life is busy but as carefree as they can make it. It is said that this area is blessed with the absolute perfect temperature: warmer, less rain and humidity than Boquete, a mere 25 minutes away, yet cooler than David, 20 minutes in the opposite direction. Potrerillos has good, well maintained schools, churches, outdoor basketball courts and soccer fields, as well as neighborhood stores and fondas (local eateries). Here, a full meal consisting of rice, beans, chicken or pork, and a salad can be purchased for between $3 and $5. This often includes a beer or soft drink. Real estate is very reasonably priced here. You can find a well-kept home in Potrerillos Arriba for $125,000. Two bedrooms, two bathrooms, gorgeous patio, large fenced yard planted with mature and prolific orange, grapefruit, and nance trees, this home was built well and is well worth the price. Nearby, you’ll come across a stunning country villa complete with a lot of over one acre. This custom designed home with attached bodega (warehouse, workshop, or guest suite), lush tropical landscaping, and bordering on a 1,000-acre wildlife refuge, is listed for $299,000. Chiriquí province, affectionately and accurately known as Panama’s bread basket, is a rural agricultural haven and Potrerillos nestles in its midst. The surrounding countryside boasts citrus orchards that run as far as the eye can see, and a juicing plant second to none, cattle ranches, and sugar cane fields for miles. Recently listed is a working 30-acre sugar cane farm, complete with processing machine and rows of fruit trees for $280,000. Lots in the area are beautiful and would make gorgeous home sites for those looking to build their own dream home. One is available for $30,000 and is fenced and situated in a friendly rural community. For those who would rather forgo city or beach life for quiet country living, this area is perfect. Within easy access to all the amenities in either Boquete or David, it is a tranquil, serene, peaceful place to call home. Retire to Panama: Who Would Ever Do That?